(19687.IN.FC1.I.10, Chester R. Cowen Collection, OHS). In July 1987 Wilma Pearl Mankiller became the first woman elected as chief of the Cherokee, the second-largest Indian nation in the United States. Born on November 18, 1945, in Tahlequah, Oklahoma, she was the sixth of eleven children born to Charley and Clara Irene (Sitton) Mankiller. Her father, who died in 1971, was full blood Cherokee. Her mother has Dutch and Irish ancestry. Before Wilma Mankiller's election as chief of the Cherokee, she served as the first woman deputy chief of the Cherokee beginning in August 1983 and became principal chief in December 1985 when Chief Ross Swimmer resigned to head the Bureau of Indian Affairs in Washington, D.C. Mankiller was elected in 1987 and reelected in 1991, serving as principal chief until 1995. As chief of the Cherokee Mankiller served approximately 140,000 enrolled members and handled a seventy-five-million-dollar budget. Increasing tribal membership and revenues by almost 200 percent, opening three rural health centers, expanding the Head Start program for Cherokee children, and starting a center for prevention of drug abuse are among her many achievements during office. In addition to her achievements as chief, she was a founding director of the Cherokee Nation Community Development Department. Mankiller helped establish an Office of Tribal Justice in the U.S. Department of Justice and helped found the Women Empowering Women for Indian Nations. Several life events as well as her Cherokee heritage motivated Mankiller to become active in Cherokee tribal affairs. Under a federal program that attempted to urbanize Indians and to help them find work, her family moved to a housing project in San Francisco in 1957. The American Indian Movement protest mounted at Alcatraz Island in 1969 and her volunteer work among American Indians in California during the 1970s provided a catalyst for her future activism. In addition, her family debated politics and other national issues at the dinner table. Mankiller met her first husband, Hector Hugo Olaya de Bardi, an accountant, in California. After a brief courtship, they married on November 13, 1963, in Reno, Nevada. They had two daughters, Felicia and Gina. 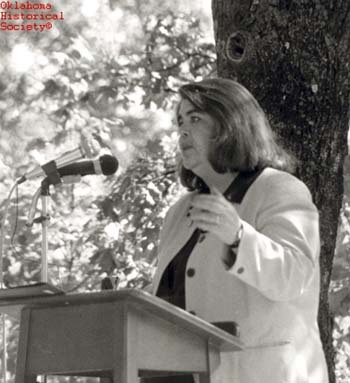 Two years after her divorce in 1974 Mankiller and her daughters moved to eastern Oklahoma, where she worked to improve rural community services such as housing, health care, and education. She garnered a federal grant to revitalize the small community of Bell, in eastern Oklahoma. Her college education with emphasis on social work and community planning benefited her work. In October 1986 she married Charles L. Soap, a full-blood Cherokee, whom she met while working on the Bell revitalization project. Despite her personal health issues Mankiller has continued to write, to speak, and to teach American Indian culture. In collaboration with Michael Wallis she wrote her autobiography, Mankiller: A Chief and Her People (1993). She edited The Reader's Companion to U.S. Women's History (1998) and authored Everyday is a Good Day: Reflections by Contemporary Indigenous Women (2004). For her contributions in community service and for her leadership roles, she has been inducted into the Oklahoma Women's Hall of Fame (1986) and the Oklahoma Hall of Fame (1994) and has received the Presidential Medal of Freedom (1998). At the turn of the twenty-first century she continued to live on her grandfather's allotment, known as Mankiller Flats, in Adair County, Oklahoma. Fittingly, Mankiller states in her autobiography, "If I am to be remembered, I want it to be because I am fortunate enough to have become my tribe's first female chief. But I also want to be remembered for emphasizing the fact that we have indigenous solutions to our problems." Wilma Pearl Mankiller died on April 6, 2010. Daily Oklahoman (Oklahoma City), 29 August 1999. Laurie Lisa, "Wilma Mankiller," in Native American Women: A Biographical Dictionary, ed. Gretchen M. Bataille and Laurie Lisa (2d ed. ; New York: Routledge, 2001). "Wilma Mankiller," Vertical File, Research Division, Oklahoma Historical Society, Oklahoma City. Wilma Pearl Mankiller and Michael Wallis, Mankiller: A Chief and Her People (New York: St. Martin's Press, 1993). Linda D. Wilson, "Mankiller, Wilma Pearl," The Encyclopedia of Oklahoma History and Culture, https://www.okhistory.org/publications/enc/entry.php?entry=MA013.